The examiner then finds a new image X* such that equation 1 from above is minimized. V is the output of the fMRI pattern. Optionally, we can combine a Generator as an input to f, X* could be generated either by doing pixel value optimization or through a Generator from a GAN. According to the paper, the depth really helps with recreating similar semantic information from the generated images. 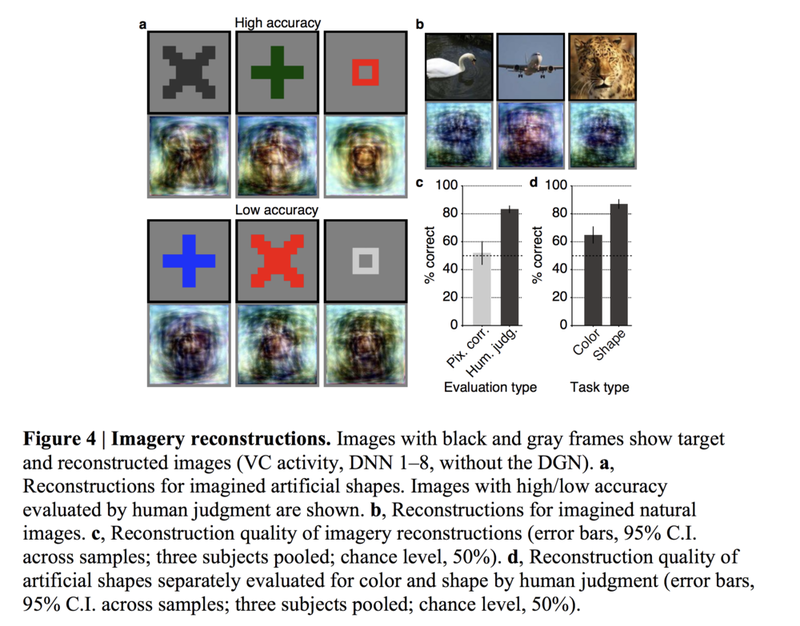 The subjective assessment showed higher rates of choice with reconstructions from a larger number of DNN layers, suggesting the improvement of reconstruction quality by combining multiple levels of visual features. Fig a. The higher the layers, the better percentage it is. The GAN acts as an natural-image prior, so that the search space is more restricted. 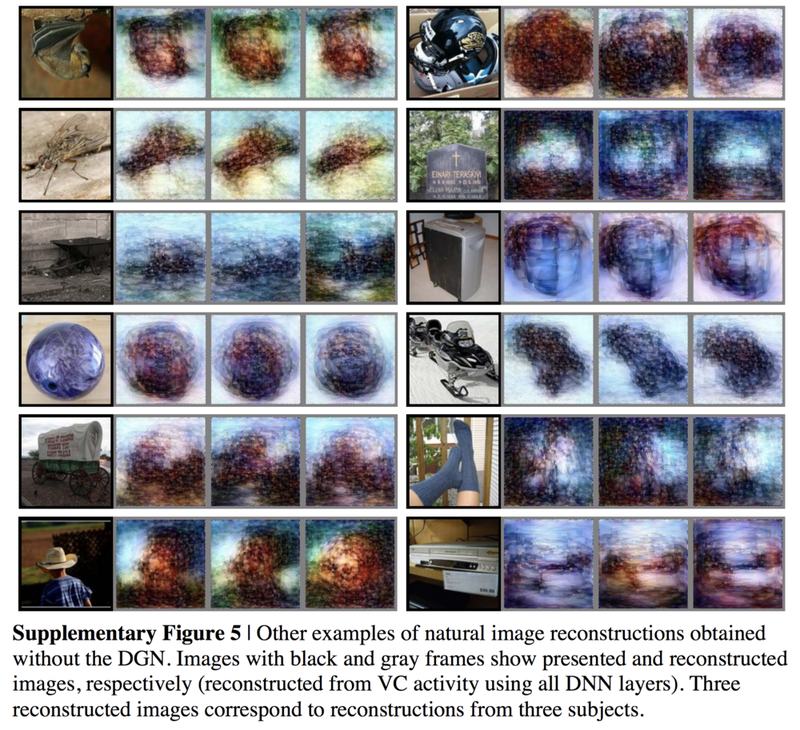 Comparison between generated images with and without DGN. This really shows the improvements you can achieve by using a GAN. The above image showed that the luminance contrast of a reconstruction was often reversed, presumably because of the lack of absolute luminance information in fMRI signals even in the early visual areas. 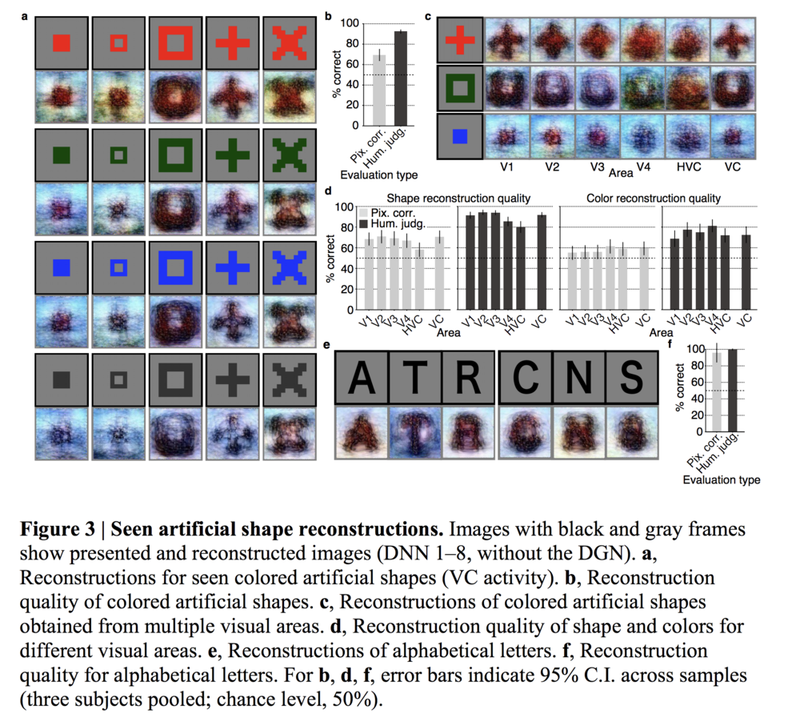 Additional analysis revealed that feature values of filters with high luminance contrast in the earliest DNN layers were better decoded when they were converted to absolute values, demonstrating a clear discrepancy of fMRI signals and raw DNN signals. Both methods compare the reconstructed image with both the original image and a randomly selected image from the pool. Since both DNN and decoding models are solely trained on natural images, this becomes challenging. My first question when I reached this part was: “why didn't they train their own model?” Then I realized that I am reading a neuroscience paper rather than machine learning paper. So many of the models that they use are actually off the shelf pre-trained model. The results show that artificial shapes are reconstructed with moderate accuracy, indicating that the reconstruction generalizes. They said that evaluations by human judgement suggest that shapes were better reconstructed from early visual areas, whereas colors were better reconstructed from mid-level visual areas. They also have a high reconstruction accuracy on alphabetical letters. Possible disagreement due to possibles, colors and luminance between target and reconstructed images. Similar to the idea that startups can benefit from a lot of APIs as was mentioned here: https://www.facebook.com/deeplearnerslearn/videos/143981816296629, it seemed like non CS papers use lots of pretrained blackbox models without delving much into training the models themselves. As we can tell from the last image, we are still pretty far away from being able to reconstruct imaginary content from just looking at the fMRI data.